From outset to implementation, CSA have provided extensive ecology, arboriculture, archaeology, landscape and agricultural land assessment services in relation to an on-going multi-plot residential development in Shifnal, Shropshire. On behalf of Taylor Wimpey and Gallagher Estates, a suite of ecological surveys revealed a population of great crested newts breeding in ponds on and close to the development site. 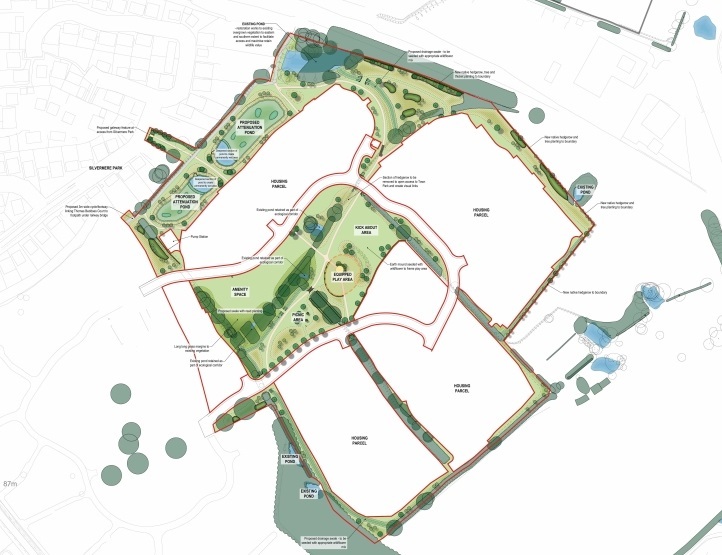 In respect of the most recent Phase 2 area, CSA designed a landscape scheme which factored in the specific requirements for a new Town Park alongside the necessities imposed by the presence of great crested newts (GCN). A GCN masterplan was developed and agreed and a European Protected Species (EPS) licences was obtained from Natural England. In 2016, a capture and exclusion exercise for GCN was completed on the Phase 2 area and CSA are continuing to provide guidance and implement licence requirements as the development progresses. In addition, to create an important new pedestrian link into an adjacent housing area, a bungalow containing a minor Daubenton’s bat roost had to be demolished. CSA undertook the necessary surveys, obtained an EPS licence and oversaw the demolition, agreeing the provision of alternative bat roosting options within adjacent habitats and new houses. This long standing project, which CSA first became involved with in 2008, highlights the strong working relationships established by CSA and the way our teams work closely with clients, becoming an integral part of the project team and helping to facilitate the development process.